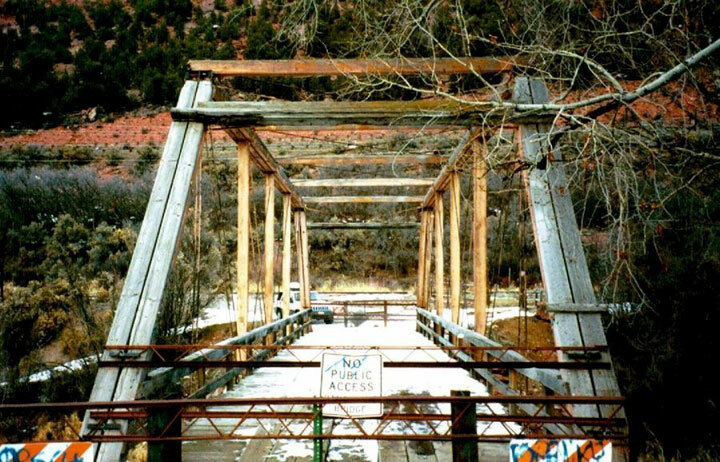 Spanning the Roaring Fork River near Carbondale, the Satank Bridge is a singular throwback to Colorado’s earliest period of wagon bridge construction. Its abutments are hand-laid stone masonry, which had been used extensively in the 19th century before the development of structural concrete. The truss span features a Pratt Configuration, patented in 1844, which would become the industry standard for medium-span wagon bridges. Timber was the material of choice for the state’s early wagon bridges before the use of steel and concrete around the turn of the 20th century. Today, the Satank Bridge is the last remaining timber wagon truss in Colorado from the 19th century. In continuous use from 1900 to the 1980s, the Satank Bridge is revered by visitors for its pastoral setting, with a view up the Elk Scenic Corridor and a backdrop of majestic Mount Sopris. The structure takes on a pink hue during sunrise and sunset, blending with the spectacular red earth of the surrounding landscape. 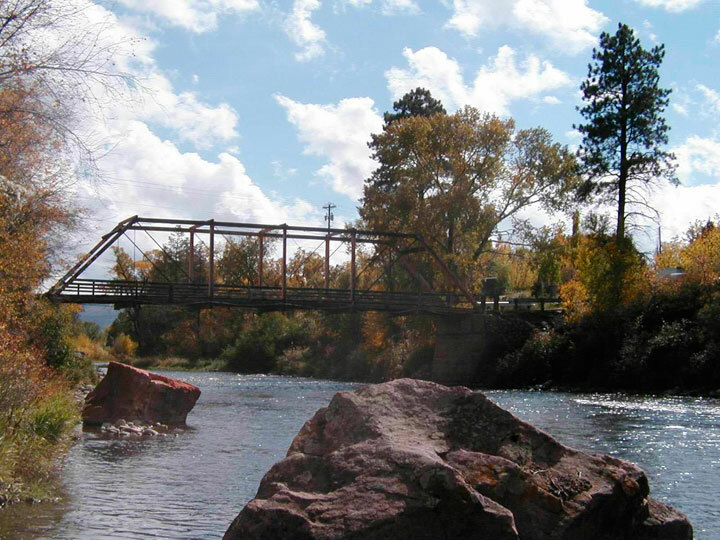 One of Colorado’s oldest bridges, it is also the longest span timber truss in the state, and is listed on the State Register of Historic Places. Supporters conducted an assessment of the bridge as the first step in a plan to establish the bridge as an interpretive stop along a river trail which will eventually connect Aspen to Glenwood Springs. In 2004, the State Historical Fund awarded a grant to the Town of Carbondale for structural rehabilitation. Unfortunately, project planners encountered difficulty reengineering the bridge for pedestrian use and the estimated project cost escalated well beyond original estimates. Fortunately, Garfield County and supporters of the bridge project applied for a new, larger grant and were awarded $297,500 from the State Historical Fund. Renovation on the bridge was completed in 2011. “For all of the ghosts who have crossed this bridge – all of the cattle, all of the people, all of the memories, this bridge has stood strong. Pass along it yourself, and add to those memories,” said John Martin, Garfield County Commissioner, at the ribbon cutting for the bridge. The restoration process involved moving the bridge from the river by a crane in 2010. All of the bridge timbers were removed and stored; the completed bridge has all new timbers but much of the steel was in tact. Today, the bridge continues to be used by pedestrians and bicyclists alike.